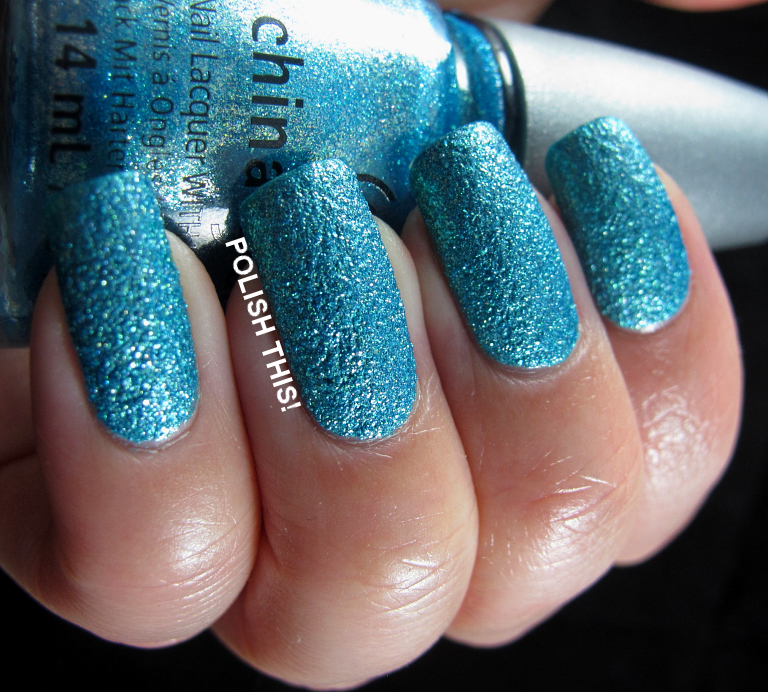 China Glaze Sea Goddess collection: Seahorsin' Around and Wish On A Starfish - Polish This! 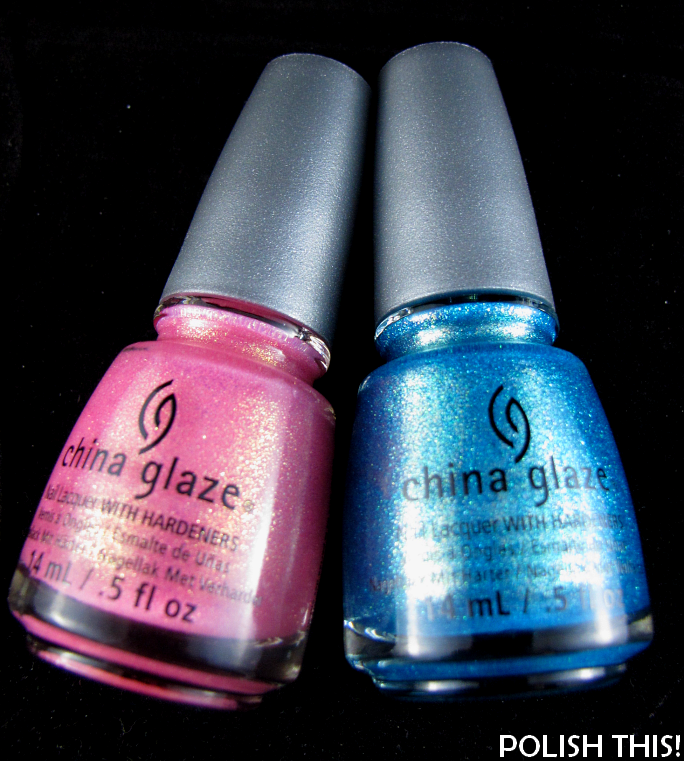 Today I have two gorgeous polishes from China Glaze Sea Goddess collection to share with you guys. I only bought two polishes from this collection, the turquoise one called Seahorsin' Around and the soft pink one called Wish On A Starfish as those two were the ones that interested me the most. Also these two looked really pretty in all the swatches I saw, so I just had to have them. First off it's the turquoise beauty called Seahorsin' Around. I used two coats here with a base coat. This one is definately my favourite and I'd say it's one of the prettiest texture polishes I have! The color is really gorgeous turquoise with quite a strong metallic shimmer and the formula was quite nice too. It was a bit on the thick side, but nothing that can't be handeled and it covered nicely with just two coats. I also love the name of this one! If you like turquoise and texture polishes even just a little bit, I'd say this is a must have! It's really sooo gorgeous and like pretty much all the texture polishes, it looks way better in real life than in any pictures. Then the soft pink one called Wish On A Starfish. I have three coats here with a base coat. This one is also really gorgeous color and I love that strong gold shimmer, but unfortunately this shade didn't go to well together with my skintone. The formula was quite nice with this one too, though this is a bit sheer, so you'll need to do three coats for full coverage. I just wish the pink base could have been just slightly cooler toned, then this would have suited me much better. It just so hard to find pink polishes that suit me! However, like I said, I really love that golden shimmer in this one, so if you think this shade will suit you, you should definately get this one. Did you guys get any polishes from the Sea Goddess collection? Which one is your favourite? Tänään esittelyssä kaksi kaunokaista China Glazen Sea Goddess kokoelmasta: turkoosi Seahorsin' Around ja vaaleanpunainen Wish On A Starfish. Molemmat lakat ovat todella upeita tapauksia, Seahorsin' Aroundista tuli ehdottomasti yksi suosikkitekstuureistani! Se on niin kauniin sävyinen eikä koostumuksessakaan ole pahemmin valittamista. Vahvalla kultaisella shimmerillä varustettu vaaleanpunainen Wish On A Starfish on sekin varsinainen kaunokainen, harmittavasti vain se on hieman väärän sävyinen omalle ihonsävylleni. Hankitteko te yhtään lakkaa Sea Goddess kokoelmasta? Mikä niistä on teidän suosikkinne? i absolutely love these two!! it's a gorgeous collection! Seahorsin' Around on mahtava. Mistä ostat sitä? I got these two too! They were the only ones that really caught my eye. How does seahorsin around compare to zoya liberty? Yeah, these two were the prettiest ones for sure. :) Zoya Liberty is way more blue looking whereas Seahorsin' Around is turquoise. Wow!!! Both manis are so pretty. I love every color and love its texture. I love textured nails for they are hard to chip off.